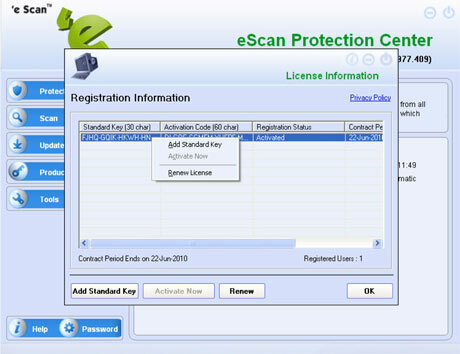 To renew your eScan product, you will require a new license key. 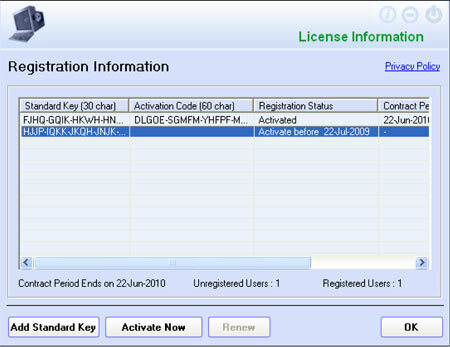 You can buy a license key from your nearest reseller or you can buy it online from here. 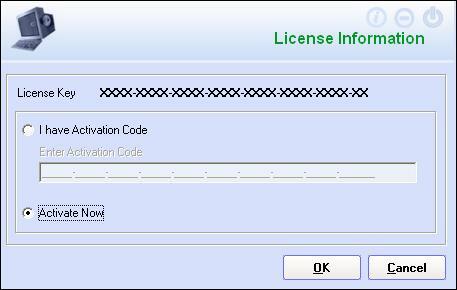 For registering the new license key (Standard Key), click on Start, then on Programs > eScan for Windows > eScan Registration. Alternatively, the window can be accessed by right-clicking on the shield in the notification area task bar then Open eScan Protection Center > Product Key. 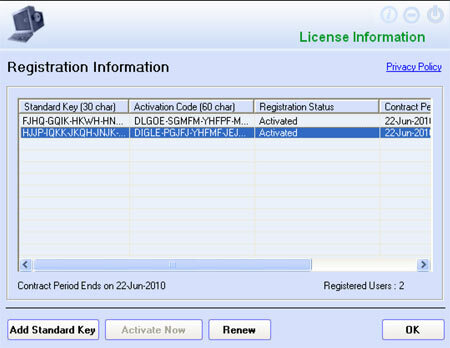 Now, right-click on the 30-character License key (Standard Key) displayed under the Standard Key tab. A contextual menu is displayed. Click on Register Now and follow from step six, else if you click OK you will see screen as in step number three. Here, click on the option Add Standard Key. The following screen will appear. 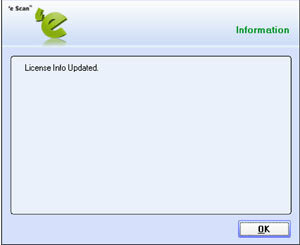 Enter the License key (Standard Key) and click OK, the following screen will appear. On clicking OK, the following screen will appear. 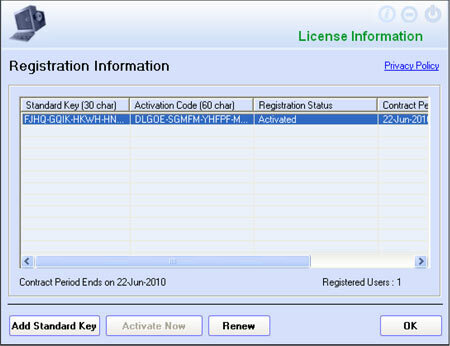 Now, right-click on the 30-character License key displayed in the column Standard Key. A contextual menu is displayed. Here, select Activate Now. 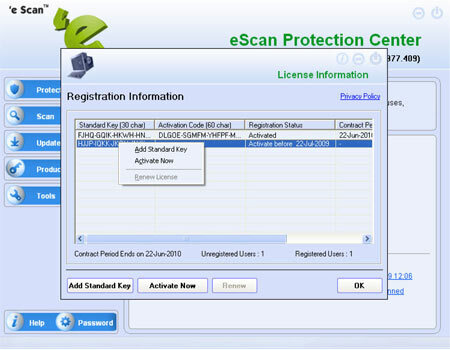 You can activate the eScan license key at the same time or at a later stage but, before the evaluation period expires. The above window will also appear, if you click the Activate Now button on the Registration Information window. 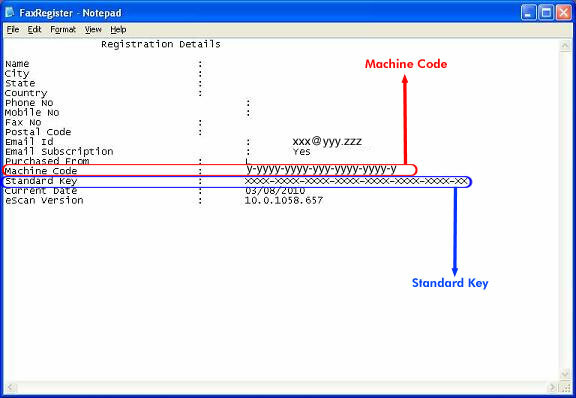 This button is enabled by clicking on the 30-character License Key in the column Standard Key in the Registration Information window. Click the Activate Now radio button and then click on OK. The Personal Information screen is displayed. In the Personal Information screen, fill in all the details and click on Next to continue. 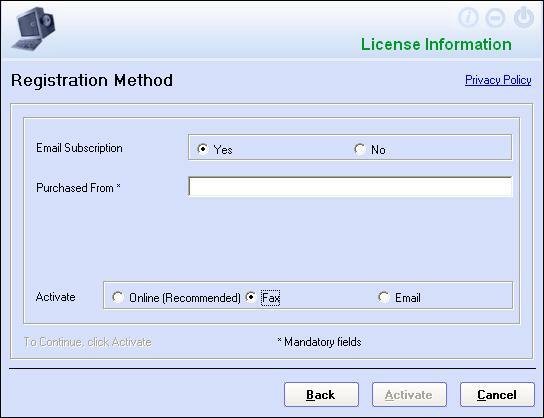 The Registration Method screen is displayed. Select the Fax option in the screen. Click on Activate, here a text file with the name FaxRegister.txt will automatically get generated, take a printout of the following text file and fax it to us at +91-22-28304750. This will enable us to send you the new 60-Character activation code to activate your eScan license via Email or Fax. If you want to receive the activation code through fax, please mention your fax number in the text file. If you want us to send the activation code via another email-id, please mention it in the text file. 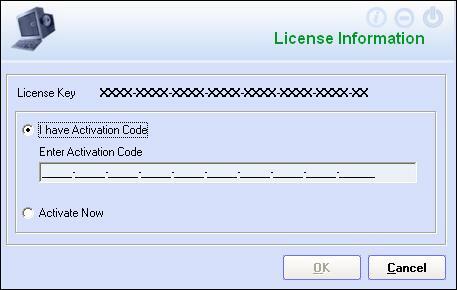 Once you receive the Activation Code as a reply to your fax/e-mail, click on Start, then on Programs > eScan for Windows> eScan Registration. Then, the Registration Information window will be displayed. 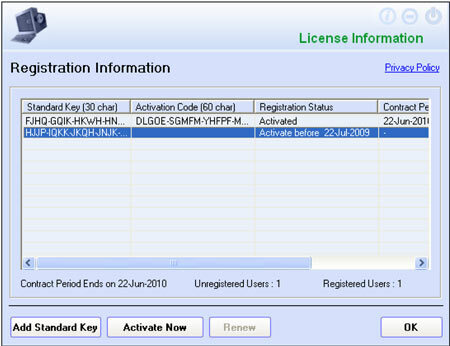 Here, right-click on the 30-character License key displayed under the Standard Key tab. A contextual menu is displayed. Here, click on the option Activate Now. 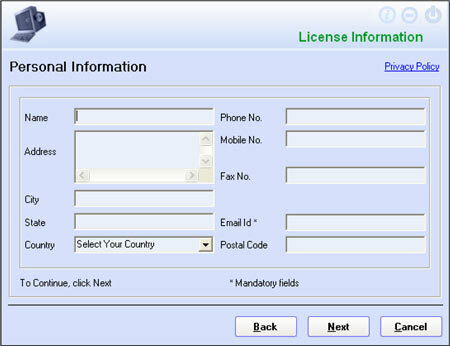 The License Information window is displayed. Here, select I have Activation code and enter the 60-Character Activation Code in the Enter Activation Code textbox and click OK.
Then, the Registration Information screen is displayed. Here, you see that eScan is registered and the activation code along with the registration status and valid contract period is displayed.